Elegance par excellence. 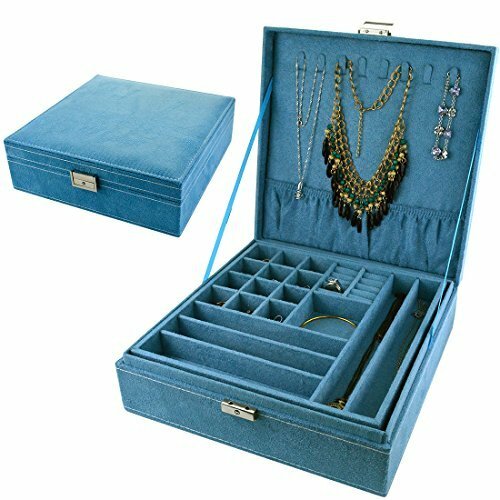 Made of the finest PU leather, innovative in design, delicious tone, this hand-crafted jewelry box features convenient compartments, unique fold out panel design for hanging necklaces and bracelets, gleaming metal clasps and handles, and large capacity to hold even the largest jewelry collections, Showcase your collection in glamour and style in this timeless jewelry case. Life with style! 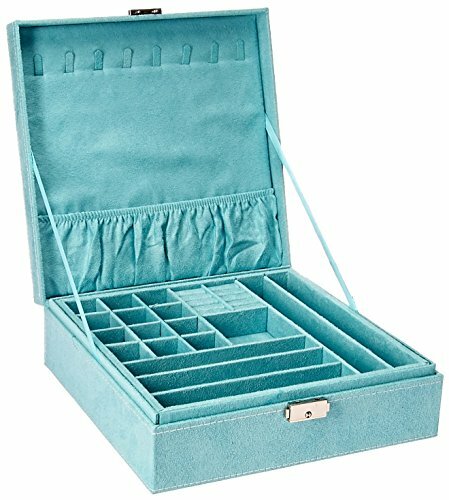 Store your Jewelry in Style with this Blue Jewelry Box. 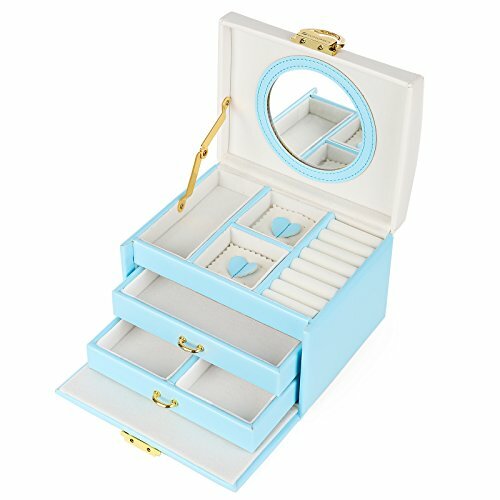 This unique and bright blue jewelry box holds all your jewelry and it does so while expressing your style. 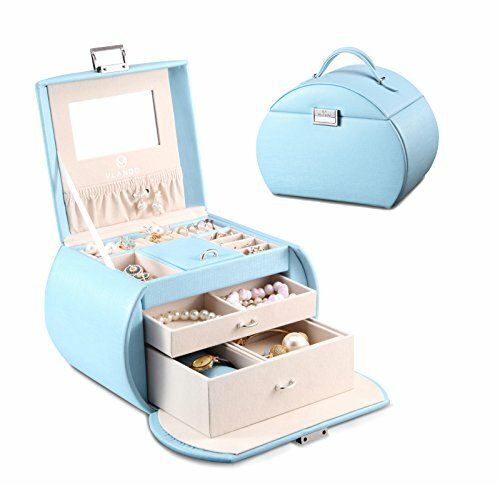 It's the perfect way to keep your jewelry safe and is easy to transport with lock and small travel case included as a bonus. 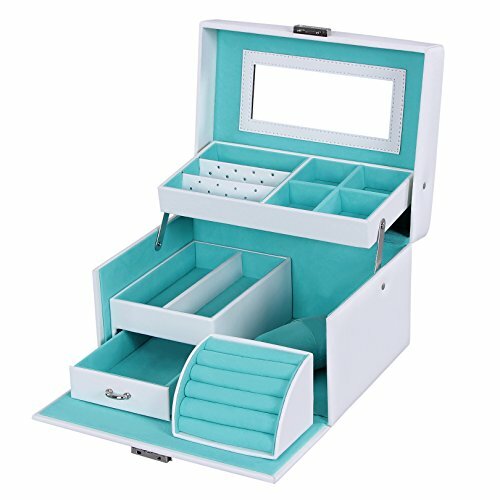 This jewelry box is just perfect for the jewelry lover, with large capacity for all of your jewelry pieces. 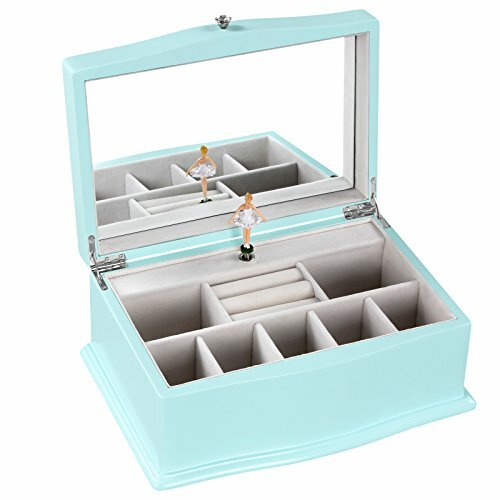 Features a soft felt interior, mirror, and bonus travel case for the jetsetter that's always on the go! 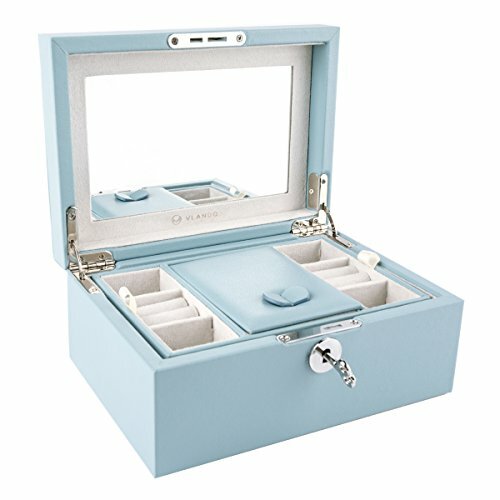 Product Details: Multiple Interior and Side Compartments Made of Bright Blue Faux Leather Features a Mirror Includes Bonus Small Travel Case Huge Capacity for all Jewelry Holds Necklaces, Rings, Earrings, Bracelets, Brooches Easy to Transport Perfect Gift for Anyone Who Loves Jewelry Organize Jewelry with a Unique Leather Blue Jewelry Box. 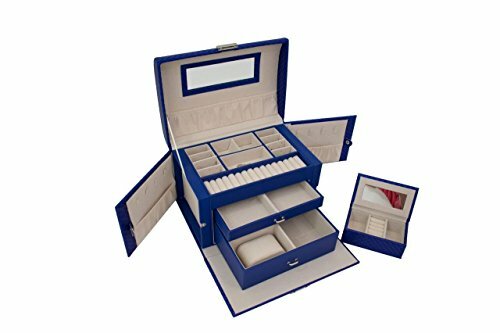 Keep all your beloved jewelry well organized, easy to find, and beautifully displayed when you store them in this SONGMICS white jewelry box. 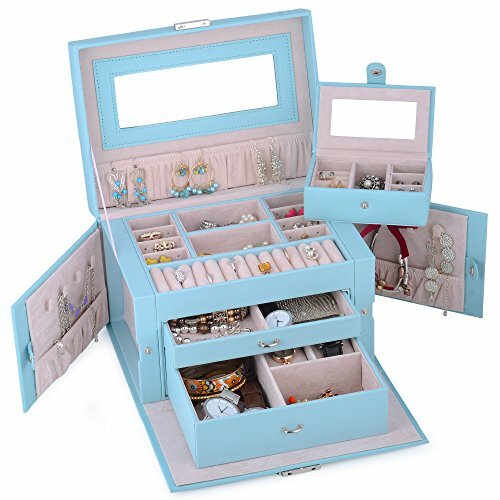 With versatile sections, the jewelry box suits for rings, earrings, necklaces, bracelets, watches and other matching items. Selected materials and fine workmanship create a fashionable look adding d¨¦cor to your home. Say goodbye to the days of hunting down jewelry you needed, and find what you need instantly. Specifications: - Exterior Color: White - Lining Color: Blue - Materials: Faux Leather Surface, Medium Density Fiberboard (MDF) Frame, Velvet Lining - Dimensions: Overall Dimension: 8.9L x 6.7"W x 5.4"H (22.5 x 17 x 13.5cm) Each Slot on the Left Side of 1st Tier with Same Size: 3.8"L x 1.2"W (9.5 x 3cm) Each Slot on the Right Side of 1st Tier with Same Size: 1.8"L x 1.8"W (4.5 x 4.5cm) Each Slot on 2nd Tier with Same Size: 5.2"L x 1.8"W (13 x 4.5cm) Drawer Dimension: 5.2"L x 3.4"W (13 x 8.5cm) Watch Cushion Dimension: 3.6"L x 2.6"W (9 x 6.5cm) Ring Set Dimension: 4"L x 2.8"W x 2.8"H (10 x 7 x 7cm) - Weight: 2.34lb (1.06kg) Package Contents: - 1 x White Faux Leather Jewelry Box - 2 x Keys"